The bestselling author of Riding the Bus with My Sister shares an illuminating and beautifully woven memoir about the unexpected ways a home renovation can repair a heart. When Rachel Simon and her architect husband begin to renovate their house on Teacher's Lane, she braces herself for the ups and downs that often accompany such projects. But to her surprise, as the old walls fall and new paint appears, she is propelled into a transformative journey as she confronts forgotten memories and repairs fractured bonds with those closest to her. This compassionate and humorous book shimmers with insights into the healing power of forgiveness, the struggle to find meaning and purpose, the compatibility of imperfection and happiness, and the ways that lost relationships—with friends, parents, siblings, spouse, and even self—can be rekindled. Fans of Riding the Bus with My Sister and new readers alike will be drawn to Simon's masterful storytelling and profoundly life-affirming tale. Her story will resonate with anyone who's ever experienced the most universal human emotion—love, in its many forms—and wrestled with its hardest questions. Rachel Simon is the author of the critically acclaimed and bestselling memoir Riding the Bus with My Sister. Her other books include the novel The Magic Touch and a collection of short stories, Little Nightmares, Little Dreams. In addition to writing, she is a frequently sought-after speaker on disability issues and the steps people can take to improve their lives. 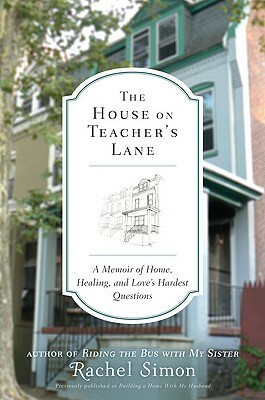 She lives in Delaware, with her husband, Hal, on a street informally known as Teacher’s Lane.